I’ve written these roughly in descending order of how much sense they seem to make for the city, but I should say that I think context matters an enormous amount in determining what kind of transit service makes the most sense, and this is meant more as an attempt at an outline of the tradeoffs involved for each option rather than a definitive ranking. UPDATE: I should also have acknowledged that the cost estimates are verrrry rough; the methodology is at the bottom of the post, but several smart people have commented to quibble one way or the other, particularly with the street-running light rail numbers. Sometimes, people say: why don’t we just build a subway? They might say this in reference to the Ashland BRT project, or the Belmont Flyover, or some other place where they’d like a rapid transit line but don’t want to disrupt the flow or aesthetics of the city above ground. Unfortunately, I have bad news: This is extremely unlikely. It’s unlikely because American subways are just ungodly expensive. (Why are they so expensive? Go ask Alon Levy.) Take, for example, the 16-mile Ashland BRT project. If we held an Ashland subway to the average cost of an American subway, it would run about $17 billion. Even the five-mile first phase would set us back $5.5 billion – nearly 12 times more than we spent to deconstruct and then reconstruct the entire 10-mile length of the Red Line’s Dan Ryan branch in 2013. Chicago’s entire annual budget is only about $8 billion, and the federal government hasn’t been handing out checks for transit infrastructure projects on that scale for quite a long time. And that’s sort of where the discussion ends. Subways have a lot of benefits – they don’t interrupt, and aren’t interrupted, by surface traffic; they’re protected from the elements; they can move lots and lots of people – but I say that in the spirit of someone window-shopping something very pretty but outrageously unaffordable. While subways are potentially useful but logistically impossible, streetcars are logistically simpler but, in most cases, their benefits are much more doubtful. That’s the recently-opened Atlanta streetcar; note the automobiles in the same lane behind it. The problem with this sort of thing, from a Chicago-centric perspective at least, is that it has exactly the same issue that Chicago’s buses have: it gets stuck in traffic, and is therefore extremely slow. Actually, it’s worse than that: buses can move around a stopped cab or double-parked car; a streetcar can’t. 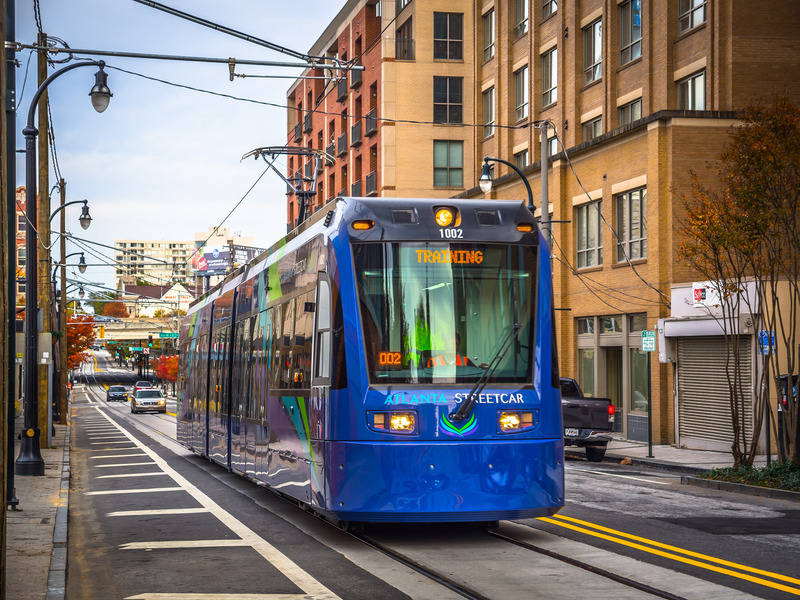 In fact, one reporter found the Atlanta streetcar to be slower than walking. The one advantage streetcars do have over buses is that they can hold more people. But that’s only an advantage if a) you need more capacity and can’t run any more buses, or b) you want to trade higher-capacity vehicles for less frequent service. Since there are virtually no bus lines on which the CTA can’t fit more bus runs – and since I don’t know of any Chicagoans who think that their local bus runs too frequently – those don’t seem super relevant here. And, for all that, you have to spend $50 million – the cost of one of those super-fancy new L stations – to build each mile before you can even get up and running. A cheap way to build a rail line that doesn’t have the traffic problems of a streetcar is to put it where there are already train tracks: in a freight right-of-way. That’s mostly what Chicago did with the Orange Line. There have also been proposals to create a line in a freight right-of-way just east of Cicero Avenue – the “Lime Line” in Transit Future. Unlike L stations on, say, the Green or Brown Lines, you have to walk a quarter mile or more through some pretty uninviting landscapes to get to the places that most people take transit to get to. That problem can be partly mitigated by integrating the station well with frequent buses that take people for their last mile, and the Orange Line makes an effort to do so – but that can still easy add ten or fifteen minutes to a trip, making it much less attractive. That may have something to do with the findings of a study last year that the Orange Line has not catalyzed development in the way that other transit lines have. Elevated trains have some of the advantages of subways – they don’t have to even think about street traffic – but are missing lots of others. Namely: they’re exposed to the elements, and are considered by most people a bit of an audiovisual disaster. They’re much, much cheaper – enough so that one could imagine the city actually procuring the money to build one – but politically quite difficult to build in places where lots of people already live and have bought homes on the assumption that there would not be a train rumbling past every five to ten minutes all day. But if you run them far away from where people actually live, then you have the same problem as freight right-of-ways: you’re not actually connecting people to where they want to go, which is usually the entire point of building a transit line. This is essentially a streetcar with its own travel lanes. Advantages, then, include that it can bypass traffic jams without incurring the expense of building either underground or an elevated structure; it also is much more likely to run near homes and businesses, as it runs in an actual street rather than a freight corridor. Unfortunately, these kinds of projects can still have problems with speed, since they may have to stop for traffic lights, and being in the middle of a busy street means they can’t reach heavy-rail speeds (the L, for example, can top out at 55 mph – which wouldn’t be allowed if it were running down Western). Still, it’s cheap and user-friendly. It’s a little-known but important fact that there are far more Metra stations on the South Side than there are L stations. Some Metra lines also have freight traffic that limits the number of possible passenger trains, but for the several that don’t – including the Metra Electric District – there’s no reason that these existing passenger rail lines can’t be turned into regular L-type service relatively easily. Make some upgrades, buy some train sets, and run them every ten minutes or so, and boom, you’ve got a new rapid transit line. Of course, the bigger issue is political. But with Toronto promising 15-minute headways all day on its commuter rail network, it’s a shame there isn’t more momentum for that type of conversion here. ¹ In every case but commuter rail conversions, I’ve come to these cost figures by averaging all similar projects currently under construction in the United States, as listed at The Transport Politic. There are a lot of problems with this: mostly, construction costs are so site- and project-specific that it’s really hard to generalize to a particular development in Chicago from things that are being done elsewhere. But this was, I thought, about as good as I could do – thus the qualification that these are only “ballpark” costs. In the case of commuter rail conversions, because there is not a single such project under construction in the entire United States (though there is in Toronto! ), and because the most likely such project in Chicago – the conversion of the Metra Electric line – has been studied and given a price tag, I just used that. Something’s bothering me about the cost estimates: there’s not enough difference between street-running light rail and streetcars, or between commuter rail conversions and commuter rail ROW lines, to justify such a cost difference. (Okay, maybe commuter rail ROW means a new elevated line in the same ROW, and then the commuter ROW is just a pre-impacted corridor, free of people who can walk to the train residential NIMBYs.) Street-running light rail is a streetcar with physical separation between the trains and the cars. That’s it. The cost difference is entirely political: usually the stations are more extravagant because it’s an Important Major Project, there may be substantial landscaping involved because it’s an Important Major Project, and there may be auto improvements nearby because Won’t Someone Please Think of the Drivers. But none of those is a necessary component of street-running light rail. Yeah, the cost estimates are weird, and definitely affected by the biases you mentioned. I’m going to question your figure for street-running light rail. ARUP just prepared a concept for such a system here in Princeton, and estimated the cost at $13 million per new mile of track. That is an order of magnitude less than the $150 million you quote above. In their report, ARUP cited recent build-outs in Portland, Seattle, and Tampa, at costs per new track-mile of $22 million, $20 million and $20 million respectively. Completely fair, and Alon Levy seems to agree with you. I wonder what accounts for the difference – I’ll ask Yonah Freemark, whose numbers I used to come up with the ballpark costs. Per single-track mile, or per double-track mile? That kind of confusion often comes up in reference to Portland’s streetcar costs, which they often refer to in terms of single-track miles. But the total route miles (e.g. double-track miles) is quite different. Ah – these numbers are all for double-track mile. Well compiled. There’s also the issue of opportunity costs within transit that is so rarely quantified (because it is so difficult/complicated). Short segments of subway can be cheaper than elevated routes through neighborhoods or along freight ROW if these other routes have a multitude of complexities that combined eliminate the cost/benefit analysis between the two alternatives. For example, if building an elevated line involves severing the trunk line for an extended period of time then part of the construction costs must include the alternative service plan during this period. If in order to stay along the cheaper right of way a connection to another transit line or large trip generator is foregone, then there is a potential loss in future ridership and an increased public subsidy for operating that rail line. Or if an above ground option requires passing over several rail lines and a highway interchange, then the cost of that construction can escalate closer to subway alternatives. Additionally if rebuilding an existing corridor involves the choice of retaining a curve which drastically slows service or demolishing a large portion of the built environment around the pinch point. Then an above ground option either leads to increased demolition costs (& potentially cultural losses), or increased operations costs & decreased capacity through maintaining the existing choke point. If enough of these constraints are concentrated along a short section of a transit corridor, then a subway could be worth the costs (as long as there aren’t similar underground constraints). Similar issues exist in comparing increased costs of heavy rail compared to other rail options. They might be cheaper, but if a large function of a proposed transit link is to integrate with an existing system, then there can be long term financial drawbacks to services which don’t interface with the existing system, like Metra Electric service to the South Shore neighborhood. Will a new service fail to attract ridership because there isn’t a cross platform connection? Will the inclusion of a free, seamless connection be cost prohibitive? Is the transit line even an attractive alternative to driving or existing transit options without these costs? So many variables, and so many choices in how to expand our transit network. No wonder that infighting leads projects to get sidetracked, while highways getting fast tracked with little consideration for how they’ll burden local road networks. Downtown apartment rents are up ~20% vs the ’07 peaks (on a price/sqft basis). Renters may be paying more than they used to, but they also have a lot more choices. Developers will complete 2,932 apartments downtown this year and 4,700 in 2016, according to Appraisal Research. Yet with developers on track to deliver a record 4,700 apartments in 2016, the question is how much longer the good times will last. “If you’re not worried (about rising supply), you’re a fool,” he said. Here’s to lower rent next year! $1.1B per mile presumes a heavy rail subway constructed with TBMs and full-length stations. In 2009, Vancouver completed the 12 mi Canada Line fully-automated light metro for $2B. Notably it was constructed as a design-build-operate public-private partnership with a 35 year operating agreement. It was constructed as a mixture of elevated track, cut-and-cover tunnelling and TBM tunnelling. It now carries 136,000 ppd. If a street is wide enough to convert into surface-running rail, then its wide enough to do cut-and-cover construction. Your subway cost estimate may too high as it’s skewed by NYC current construction, which is overpriced even for US standards for some reason and made worse as it’s all in Manhattan, which I assume is harder to build due to infrastructure crowding. Los Angeles’s purple line extension is $500 million / mile, that might be a better comparison to the Ashland corridor. of the proposed stations on the future Red Line which could be served before that plan is even engineered. A couple passing sidings, four platforms and Ventra TVMs . Hard to pretend that could cost $135 million. There is of course, precedent for Metra operated service 30 yrs. ago when the South Shore was short of functional cars and diesel pulled bilevels ran Hegewisch-Randolph St shuttles.. In the 14 miles from Kensington to Millennium, at $27 million a mile we should be able to restore the 5th/6th tracks between 12th and 51st, and maybe a 5th bypass track between 51st and 67th. One should note that a comparison of today’s headways with the mid 50s shows that we could easily bring service to 20 minute headways to So Chicago, 30 minute shuttles to Blue Island, connecting with Hegewisch trains. If one assumes that the track upgrades north opf 67th are delayed, the money not spent should buy somefurther rolling stock as add on orders to the current MED fleet. Bottom line is we should get a major improvement in South Side transit at a very low price point. Once that has shown success, the Rock Island is the next candidate tor better service. .
On the Ashland Avenue issue’ The Paulina connector if restored and extended to connect both directions to the Orange Line while not seeming like much would allow major improvements. First if restored to the Blue Line at what was once Evergreen Jct where the Blue rises from the Milwaukee subway and south from the Pink Line south to the Orange we have the airport to airport express as well as North West Side access to UIC and the Medical Center without going through the Loop. Making the connection to the OrangeLine L going East is the start for a branch to McCormick Place–again airport to destination skipping Loop, + convention center/hotels service personnel from all over get better access to their jobs. Yes, none of this would be as cheap as simply running more TPH on the MED, but the two segments of Ashland south of the Pink Line and the Paulina Connector back to Evergreen are relatively short, but should be a good investment because they tap markets not well served by existing outes. The same for an extension off the concrete elevated structure to McCormick. General money thoughts. I am profoundly angry that transit has to beg for scraps while the five sided money BBQ in VA gets more than it asks for when some bough Congress critter wants welfare for avendor in his district. And, I am furious at the disgustingly overpriced subway projects in NY. Not only have we been cheated of a proper multi-track trunk line Second Avenue Subway but the time penalty of having the tunnels so deep defeats “rapid” transit. And then we have the silly diagonal elevator chosen for the 7 extension whose failure alone has caused a multi month delay in openiong the line. So we have a severe cost penalty issue to tackle all across the country if we want ANY signioficant transit improvements.